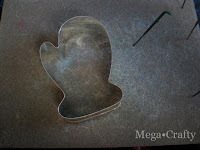 I started with the mitten shaped cookie cutter, my needle felting needles, and mat. 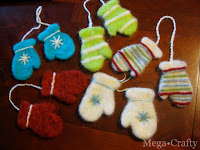 Stuffed the cookie cutter full of wool. 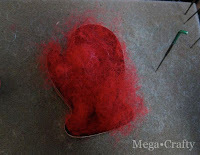 Then needle felted until the shape started to hold together. 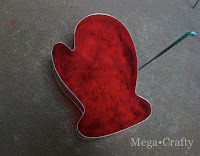 Once the wool starts to hold it's shape, pick up the cookie cutter and the wool, then flip it over and needle felt the other side. 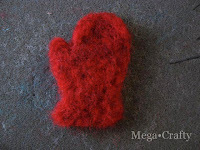 When I was done felting I had a perfect little mitten! Then made another so I had a pair. 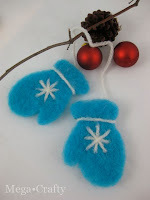 Once I had a bunch of mittens, I decorated them by needle felting scraps of wool yarn onto the front. 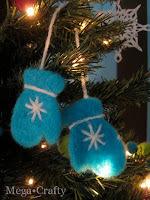 The last step was to attach a piece of yarn between the pair and hang them over a branch on the tree. 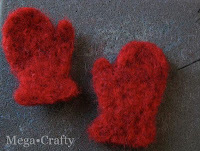 You can use cookie cutters to needle felt lots of shapes. I've made stars and circles for banners before and they've turn out super cute! These ornaments would also make great decorations for gift packages too! Just tie them around the bow and the recipient gets the gift plus a nice keepsake ornament.